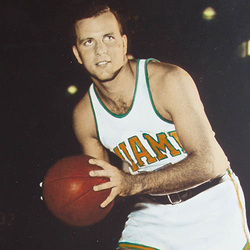 Julius "Julie" Cohen was a three-time letterman (1960-62) and finished his UM career ranked first in games played (80) and fifth in scoring (1,042 points). In his sophomore year of 1960, Cohen was a member of the UM basketball team that went 23-4 and was the first squad to advance to the NCAA Tournament...back when only 16 teams competed. The team went 20-7 the next year and qualified for the National Invitational Tournament in New York. After his junior year, Cohen was selected to the U.S. Basketball Team for the 1961 Maccabiah Games in Israel. For his career, he averaged 13 points per game, including a creer high 14.5 points his senior season. He was coached by legendary Hurricanes Coach Bruce Hale.